York Round: 72 arrows shot at 100 yards, 48 arrows shot at 80 yards, 24 arrows at 60 yards. American Round: 30 arrows at 60 yards, 30 at 50 yards, 30 at 40 yards. Team shoot (four archers): 96 arrows at 60 yards. National Round: 48 arrows at 60 yards, 24 at 50 yards. Columbia Round: 24 arrows shot at 50 yards, 24 at 40 yards, 24 at 30 yards. Team Shoot (four archers): 96 arrows at 50 yards. Boys-junior American Round: 30 arrows at 50 yards, 30 at 40 yards and 30 at 30 yards. Girls-junior Columbia Round: 24 arrows at 40 yards, 24 at 30 yards, 24 at 20 yards. Team Shoot for Boys (four archers): 96 arrows at 50 yards. Team Shoot for Girls (four archers): 96 arrows at 40 yards. 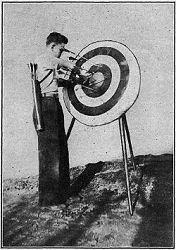 The Standard 48" Diameter Tournament Target is used at Archery Meets. The standard target is a round bast of spirally sewn straw, covered with a face divided into a central disc, 9 3/5 " in diameter, and four concentric rings, each 4 4/5" in width; painted respectively, from within out, gold, red, pale blue, black and white. Until one does a little figuring, the exercise enjoyed and the energy expended, is not realized. Let us assume that you shoot a Single American Round (90 shots) with a bow weighing or pulling forty-five pounds-about the average for men. Ninety shots means pulling ninety times forty-five or 4,050 pounds. That's about two tons. Each time you loose the arrow, that 45 pounds for each shot is taken up by your bow arm, the arrow and your shoulders. In walking to the targets and back again, after each six shots, in running about looking for misses, you walk at least a mile. If you use a stronger bow, say fifty pounds, you can see that the poundage mounts up. Shooting the York Round, since the distances are longer, requires a bow of respectable weight. Fifty and fifty-five pounds is not unusual. A hundred and forty four arrows at fifty pounds pull each makes a tidy sum —7,200 pounds—and you walk about two and a half miles. A National Tournament is a never-to-be-forgotten sight. A hundred gay targets all in a row! Flags and pennants joyously fluttering from tall bamboo poles! Lines of bowmen in action! The arrows hiss through the air and strike the targets with a "puck", "puck", "puck". The picture is all color, graceful action and romance. Old friends meet year after year, new ones are made and ideas on tackle and shooting are exchanged. After the tournament a banquet is held and the prizes awarded. Everyone goes home sure that there are no finer ladies and gentlemen, no better sports and no nicer people generally than archers.